On the page (in French) showing banknotes brought into circulation in the Hulun Buir region (Inner Mongolia), end of 1919. For a short time, China managed to recuperate Mongolia (lost in 1911 to Russia and regained in 1919) only to lose (Outer) Mongolia again, this time (1921) to Ungern-Sternberg and his eventual successor, the People's Republic of Mongolia. But Hulun Buir, as the rest of what is called Inner Mongolia, remained in Chinese hands. The 25 Yuan note features the flag of the Chinese Republic although I have no idea what the small flags (or pennants?) represent. 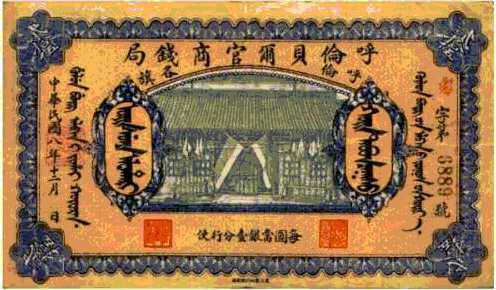 Both banknotes are bilingual Chinese and Mongol (see the script, later to be replaced by Cyrillic). Barga- also Hulunbuir. Barga is a region in northwestern Manchuria slightly larger than Illinois. It was a major goal of Russian expansionism during the early twentieth century, due to its abundant natural resources. While the area was under Chinese jurisdiction, many Russians emigrated to the area, and by the Chinese Revolution of 1911 outnumbered the Chinese, although not the native Mongols. As Chinese central authority collapsed, the Bargut Mongols (with a great deal of Russian "assistance") declared their independence, announcing their intention to join Mongolia. When Manchu troops were dispatched to Barga, they found that the Mongols had large stockpiles of Russian materiel, and Russian troops had entered the territory to train and assist the Bargut fighters. The Chinese were steadily pushed out of the province, and in March of 1912 Barga formally seceded. At this point, the Russians generously offered to step in as mediators. The weak Chinese Republic agreed to Russian conditions, and Barga was made an autonomous province, while the Russians gained a great deal of influence. At several times, Chinese troops entered Barga to test the Mongol defenses, and Russian troops intervened rapidly. Barga's autonomy was revoked in 1920, as Russian power in the east collapsed. Many commoners and nobles in Inner Mongolia as well as Hulunbuir and some Huh Nuur Mongols agreed to cooperate with Bogd Khanate Mongolia. Khalkh conquests freeing Inner Mongolia from Republic of China was mostly successful until Russia and China called Bogd Khanate leaders for trilateral summit in Khyagta disabling Bogd Khanate Mongolia to expand their territory. Another thing happened was that Bogd Khanate Mongols freed Hobd territory from Manchu rulers incorporating non-Khalkh territory into their land. Then I suspect that Hulunbuir was conquered by China togheter all independent Mongolia in 1919. In 1920 was liberated by Von Sterneberg and in 1921 was enclosed in the Mongolia Peoples Republic, and remained in this until 1929 (after a failed independence movement in 1928) when was proclaimed newly independent republic. Later I donЁЏt know if the republic joined the Manchurian government of Zhang Xueliang (the son and successor of the warlord Zhang Zuolin + 1928) or remained independent until 1931 when the Japanese soldiers occupied Manchuria. Early in his political life, Merse established close ties with the independent state of < http://en.wikipedia.org/wiki/Mongolia > Mongolia and the Soviet Union. In 1922, he attended a pan-Mongol conference organised by Buryat at Verkhneudinsk (today Ulan-Ude, capital of the Republic of Buryatia). In October 1925, he became the secretary-general of the newly-founded Inner Mongolian People's Revolutionary Party at Kalgan (Zhangjiakou). Even the name of the party itself represented Merse's careful balancing act between the Mongolian People's Revolutionary Party in independent Mongolia, and the various political parties in China, at a time of Kuomintang - Communist Party of China cooperation: the Mongolian name echoed the MPRP's Mongolian name, while the Chinese name echoed " Kuomintang". Ulanhu would later try to frame this purely as a split between KMT and CPC supporters). Merse and other left-wing elements within the party took steps towards more radical action: organising an armed uprising. Comintern agent Ivan P. Stepanov promised them arms and funding. Thus, in 1928, Merse and his Daur compatriot Fumintai (ИЃУїЬЉ or АНУёЬЉ) led a group of Barga Mongols in an uprising in his hometown Hailar, attempting to establish local autonomy. Sources refer to this by a variety of names, including the "Hulunbuir Uprising" and "Barga Rebellion". However, the Comintern repudiated Stepanov's statement, and the Mongolian and Soviet governments denied all association with the uprisings, and arrested Merse's associates who had gone to Ulaanbaatar during and after the uprising. No outside support would be forthcoming. The Chinese authorities arrested China Eastern Railway assistant director Mikhail Lashevich in connection with the uprising in August 1928 Merse was thus forced to end his uprising and make peace with Zhang Xueliang in September 1929. The Barga, for their part, fled to independent Mongolia, where they would become the target of political repressions in the next decade. According Enciclopedia Hispano-Americana (know as Enciclopedia Espasa, edited in Barcelona betwen 1910-1920), Appendix 7, pag. 632, published 1932, in the exposition of the recent history of Outer Mongolia, states (my translation to English): 12 december 1929 was proclaimed in the district of Burga a new independent republic that has by capital Hailar. Seems clear that independence was from Outer Mongolia.